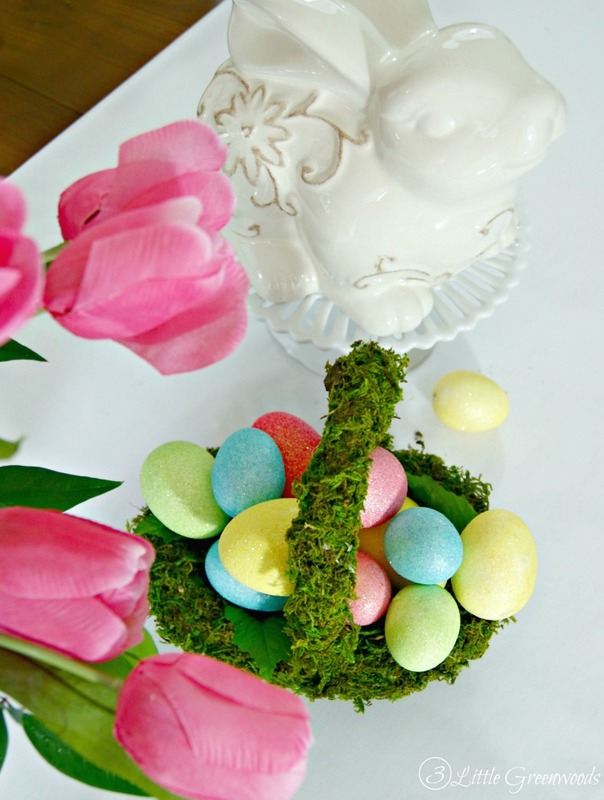 Fabulous tutorial for how to make a DIY Moss Basket that is perfect for an Easter tablescape. I can picture it in my head. 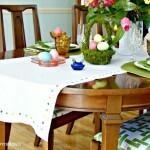 A beautifully appointed Easter table with a crisp white table runner. My wedding china and crystal placed carefully around the table. Near the center a petite moss covered basket overflowing with sparkling Easter eggs. Then I realized that if I was going to make this Pottery Barn look alike Easter tablescape a reality I better get crafting. One bag of moss and one thrift store basket later I have the sweetest little DIY Moss Basket that will be perfect for our Easter celebration. 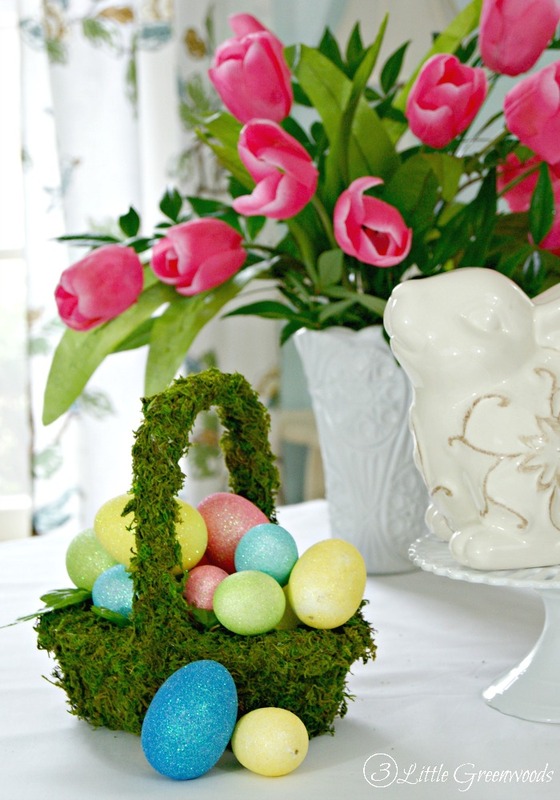 This DIY Easter Basket is a Pottery Barn Knock Off version of Pottery Barn’s Greenvine Baskets. But at the fraction of the price. My moss basket cost approximately $2 while Pottery Barn’s version was originally priced at $20. That’s $17 in my crafting budget for more DIY Easter projects. This post may contain affiliate links marked with an asterisk. Click here for my complete disclosure policy. Thanks to 50% off day at the thrift store I was able to pick up the perfect sized basket for 75 cents. The bag of green moss* came from my favorite craft store and cost $3 with one of those fabulous 40% off coupons. Begin the basket by prepping the moss. Remove half the moss from the bag then fluff it up by tearing it apart. Lots of fluffy moss makes covering the basket easier. 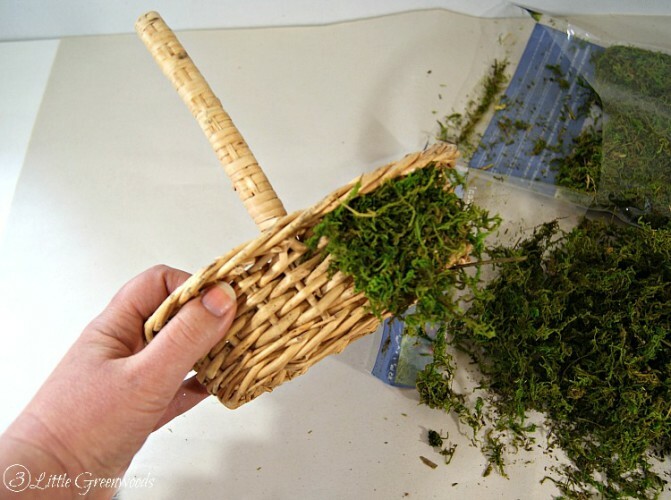 Carefully use hot glue to attached the moss to all of the outside areas of the basket. Apply moss to the inside and outside of the basket handle. Remember to add the moss gingerly so you do not get hot glue burns. Your fingers will thank you. Double check to make sure none of the original basket is peeking through. Small bits of moss may need to be added. When the entire basket is covered with moss it will need a bit of a trim. Use scissors cut back any stray pieces of moss. Once the diy moss basket has a haircut it is ready to decorated with. 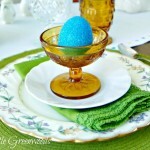 Filling it with colorful, sparkly eggs makes it a lovely addition to our Easter tablescape. I am beyond excited with how perfect the little moss covered basket looks on my table. Paired with a bunch of fabulous tulips and a cute little bunny friend, it almost feels like Easter! You’ve seen my #MakeIt project, now please visit some of the other wonderful blogger in this challenge and check out their beautiful Easter projects! What treasured or fun piece of home decor will grace your Easter tablescape this year? I would love to hear all about it! 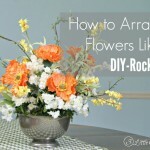 I love a good dollar store craft as well as a good pottery barn knock off! You did both in one project! Love that you made it for only $2. Very nice! I love this project Ashley! I love anything that involves a thrift sore makeover. These are so great! Ahhh! I love this! I love all things moss related, but every time I try to make something with it, it all ends up in disaster!! Such a cute project, Ashley!! Thank you SO much, Holly! It looks so stinking cute on my Easter table! This is a beautiful idea! I love it so much, and the glittery bright eggs are just perfect with it. Super cute! It’s amazing what some places charge. If you want something done right, you gotta do it yourself. Great job. There was no way I was paying Pottery Barn prices for a moss covered basket! Plus I love the way mine turned out. Thanks so much for the sweet comment, Sara! Thank you so much for the sweet comment! I’m so excited you like my little mossy basket! This is so cute! 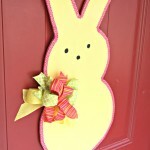 I think this will be something I will do for my Easter decor this year. I love working with moss home decor for Spring an this is perfect! I love how brilliantly green the moss is! It’s messy but adds so much to a project! Awe! So Cute. I love this. This is so cute! Love this!!! I will be making one of these for sure. Yay! I would love to see a picture if you do. Post it to my facebook page! Moss is so much fun but can make such a mess! I made sure to make my basket over a piece of throw away paper. This is such a cute idea! I might try my hand at this for my son’s easter basket this year. I’m not very crafty, but this looks like I might be able to do it! This is a super simple craft. Good luck and thanks so much for the comment love! This is so cute!! I want to make one now. It’s a super simple Easter craft! Good luck! I love this!! I think I can get all the supplies at the Dollar Store too so this will be a super cheap craft to make! Thank you so much for sharing. Pinning this! The Dollar Store ROCKS! Thanks so much for the pin! This is adorable! 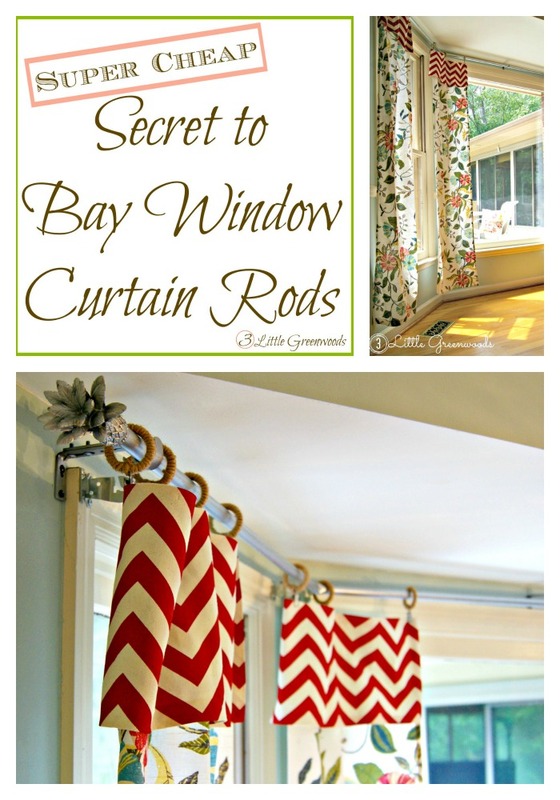 I am not very crafty myself but this looks so easy I might be able to give it a try with my toddlers. Thanks! I like this and after reading your directions it looks really simple to make. I am not overly crafty, but I would give this a try! Oh, Michele! You should so make one. It was super easy and quick. Just watch out for those burned fingers! Ashley, this is sweet! I just love PB’s holiday ware, and I love a good knockoff even more. So adorable! Pottery Barn always has the most adorable holiday accessories. It’s a good thing we don’t live anywhere near one! Ashley, you did such a great job! That is super cute and I’ll have to add this to the Easter decorations. Thanks so much! It was so much fun to make and looks precious on my dining room table! Thanks so much! My little moss covered basket was so fun to make! 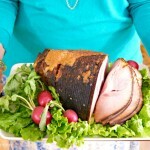 Looks great and easy to make! This little mossy covered basket was so easy to make! I hope you try it for Easter! This is so pretty. I love it and easy to make too. I’m featuring this post at the Merry Monday party which begins tonight at 9pm est. YAY! Thanks so much for the feature! Thanks so much for hosting your fun and creative party! Yep! Goodwill projects are the BOMB! This is so cute Ashley! 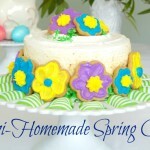 Now that I found out I’m hosting Easter, I have the perfect excuse to make one of these for myself. I am in love….with your cute, cute ideas! I bought a tacky-tacky bunny rabbit basket at Salvation Army…..didn’t know what or if I would ever use it until now….How adorable… I will be working on my own moss project ASAP! Thanks for the inspiration, once again. Love. 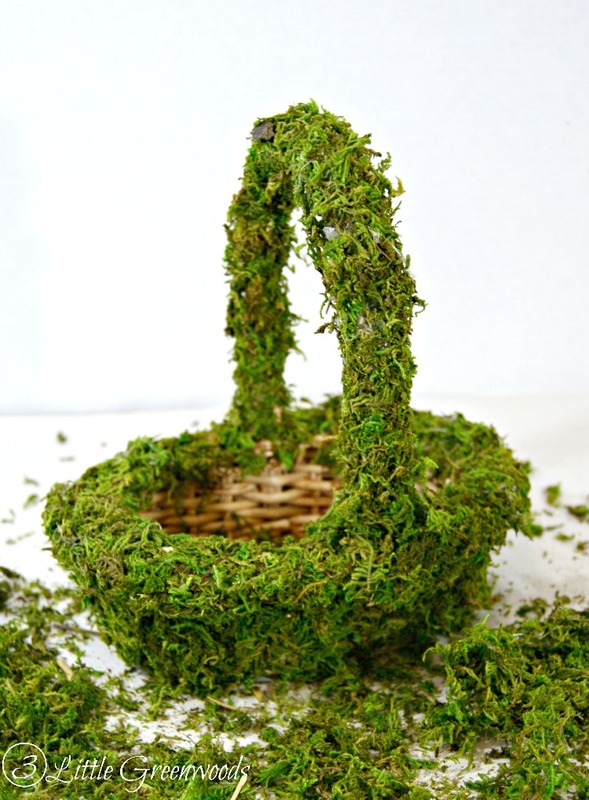 Oh I hope you were able to make your own DIY Moss Covered Basket! Thank you so much for the wonderful comment! 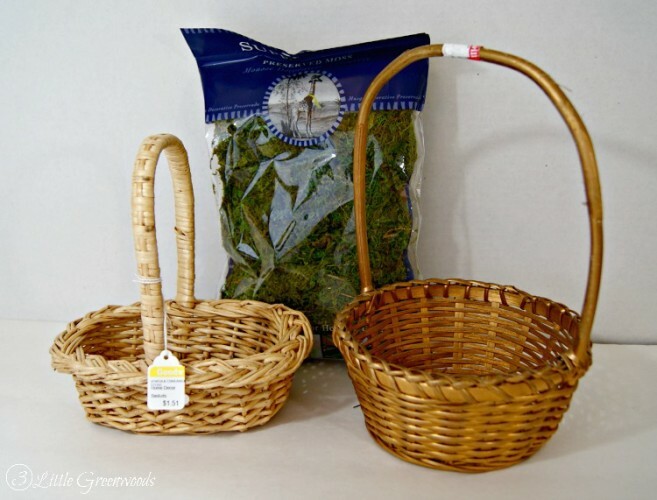 I have everything needed for the moss basket with plastic glittered eggs. I will make one today! Thanks again Ashley. 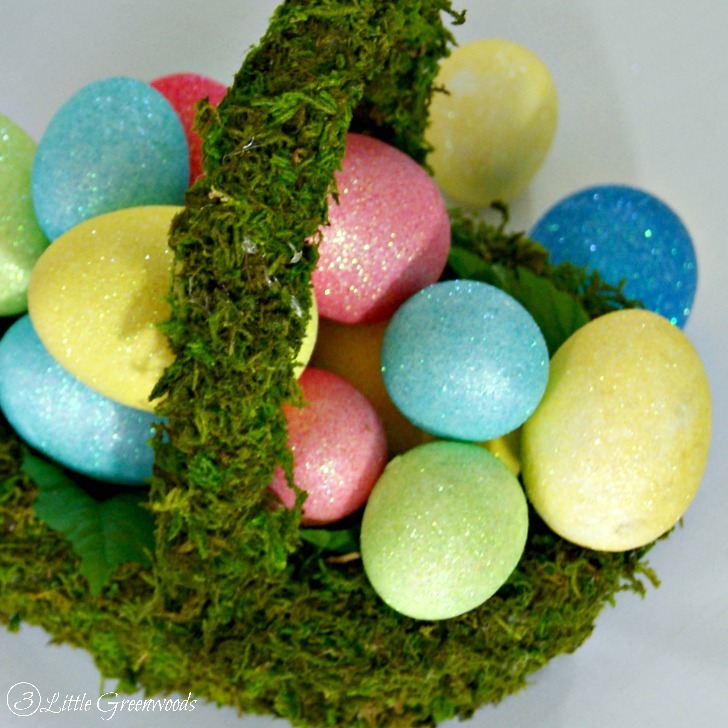 I hope you were able to make one of these little moss covered baskets for your Easter table! Happy Easter! What a great idea and love that it’s a cheaper knock off. Very pretty decor. Stopping by to let you know you are being featured on Friday’s P3 Party post! Have a great week! Thanks for pinning! You are SO awesome! Thank you so much for the feature! 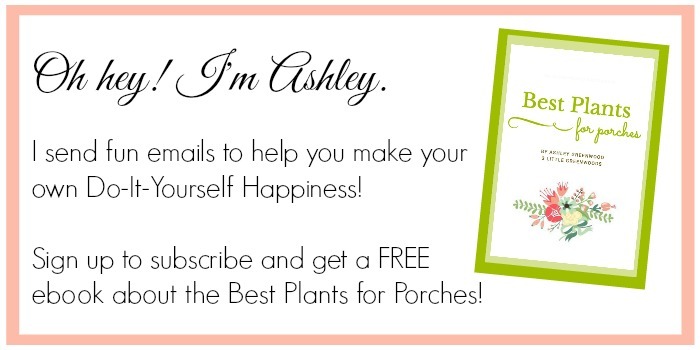 This is so precious, Ashley! I’m so glad you linked up to the party this weekend! Thanks so much, Kristi! 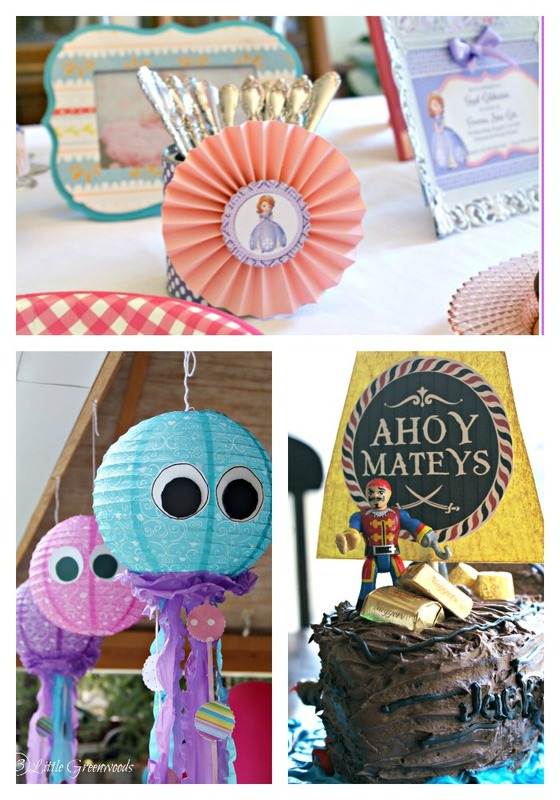 I always love all the DIY inspiration I find at your linky party. Best wishes with all your new house adventures! This is really cute!! Visiting from the Pretty Pintastic party!